Yes, this week has been too busy, too many hours away from home, too much school! Yes it's all worthwhile, and important, but still I was longing for my home time! I was able to sew a couple of bags this week. This one is a little bag that fit my camera so perfectly, I just had to keep it! My other bag was bunk, and kept opening up, letting the pricey camera fall where it may. 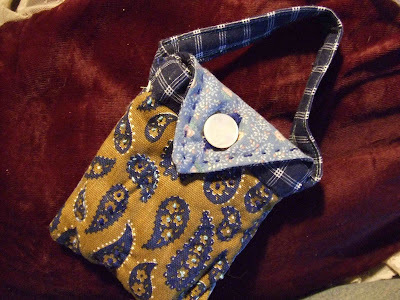 This bag is sturdy, folky, and has nice texture with a little embroidery here and there. I love the feel of the French knots. This is a little print of a painting I did in 2002 which was printed on fabric. This is the other side of the little bag. I love the vintage canvas style of fabric in brown with the paisleys. I've always enjoyed brown and blue together. 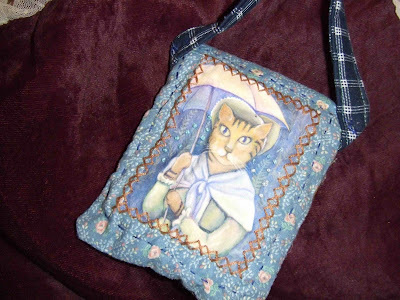 I've also got another little tote-style of purse which features a print of my little "Perplexed" Flapper. It's in the shop. It's in the colors of pink, brown and a little lime green. I really love the "cat bag". I'm always fascinated by art that has been transferred to fabric. If you get a chance, come on over to my blog, as I am having another contest. 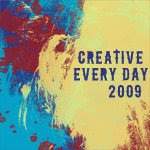 This time, the winner will receive a 4" x 6" print of one of my collage pieces called "Dancing Fiona". Wow! Love your camera bags! I went to the flower type site, and I came up a canna, but I was a little disappointed that there didn't seem to be any explanation behind the flower choice, no 2 minute psychoanalysis! Oh well, kinda fun. And maybe now I'll have to look into planting some canna lilies!